I’ve was never one for public speaking — until I made one simple change. Getting up in front of others and pretending like your life is interesting, and your thoughts are interesting? Not for me. The realization that changed my mind, however, was that I shouldn’t be talking about me. Now that my focus is on providing value to my audience, and connecting with them, every experience has improved. 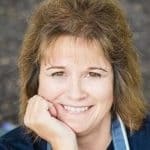 I love working with food bloggers, and seeing that light in their eye, as what I’m teaching begins to connect with their own personal experiences! In this session, participants discover how they can become more than just a food blogger by focusing on a very specific niche and appealing to a tight group of readers. After a concise, 10-minute presentation on the ways in which a narrow niche can benefit your blog, attendees break into groups of 3-4. Each group chooses a niche and brainstorms articles, series, and ebooks that might attract visitors interested in those topics. Then everyone comes back together to share their ideas with each other. This workshop is best suited for audiences of about 30-40 people. Often, we get wrapped up in the idea that we need more readers to get more page views to see more ads to make more money. In fact, with a good content strategy, we can sustain a profitable blog by focusing more on our own talents than on the number of ad units we’re displaying. This workshop shares a number of different methods for going about monetizing your blog, includes a short worksheet for getting started, and ends with small groups sharing their ideas. Any size audience will benefit from this workshop. The most important lesson I’ve learn with my business is that time management is a frame of mind. Ask yourself, “what can I do today that will make the biggest impact on my business tomorrow?” Bloggers so frequently get caught up in the tedious tasks, they forget that by making a plan and being strategic with their decisions, they could grow their blog far more than before. This workshop shares a number of tactics for managing time, includes a short worksheet for getting started, and ends with small groups sharing their thoughts and experiences. Any size audience will benefit from this workshop.